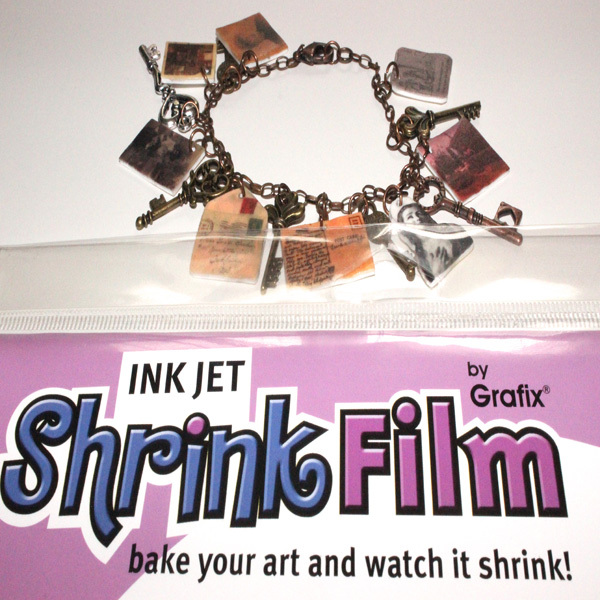 Project Description: Learn how to create a vintage-inspired shrink art charm bracelet with Grafix Shrink Film. First, measure the chain length needed for your bracelet. This will determine how many charms you can use to fill the space. If you are using old photographs, you’ll need to scan those on to your computer. If your desired photographs are already digital, you can skip to step 3. Use a basic photo editing software on your computer to lighten the opacity of your photographs. When your shrink art gets heated, the images will darken and intensify. By lightening the opacity (no more than halfway), your shrunken photos will remain relatively clear and unaltered when heated. Align your photos on a single document, being mindful of the page margins for printing. Remove all other paper from your printer and insert a single page of Grafix Inkjet Shrink Film. Since it is the standard 8.5” x 11” size, you likely will not have to adjust your printer settings. After printing, be sure to let the page fully dry before carefully cutting out your photos. Punch a single hole near the top corner (or top center) of each image, being careful not to cut out any faces in the image. For better control of how the shrink film is heated, I use an embossing gun. When using an embossing gun, you’ll want a heat-proof area to make your shrink art. I prepped a baking pan with parchment paper and kept an oven mitt handy for adjustments during the heating process. If you would like to use the oven, simply follow the directions on the Grafix package. Note: The shrinking film will occasionally curl when heated. This is normal, and the plastic will usually flatten on its own. If it doesn’t, try letting it cool for a moment and reheating while flattening it manually with an oven mitt. The shrinking plastic will be pliable for a few moments until it is cooled completely. Use caution during this process. After the shrunken photographs are completely cooled, you’ll want to protect your art. Using a small paint or craft brush, lightly apply 2 coats of Mod Podge matte finish sealer. Paint in a uniform direction, using only a small amount. Let them dry fully between coats. After your art is sealed and dry, it’s time to get the jewelry started. 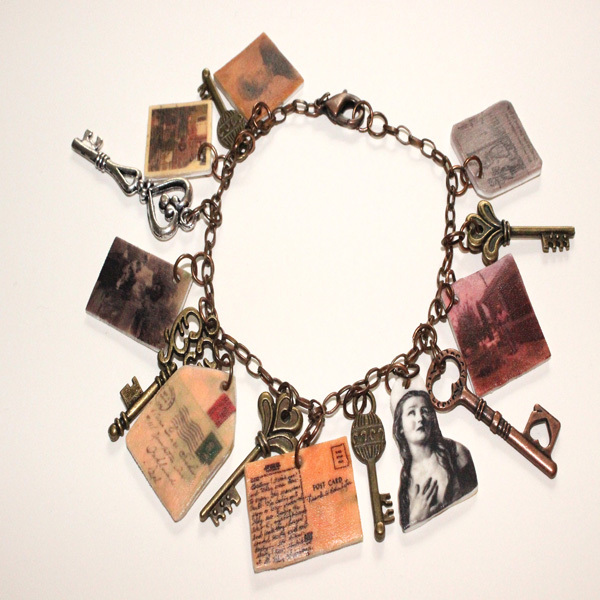 Alternating between the skeleton key charms and your shrunken photographs lay out the design of your bracelet. For better movement of the charms, use two findings for each shrunken photo, and one finding for each key. Carefully assemble using needle nose pliers. Attach a larger finding on one end and a jewelry clasp on the other. Wear your vintage-inspired charm bracelet with pride!